The federal government is willing to pay up to half the bill for states that want to convert to a new Comprehensive Child Welfare Information System (CCWIS), designed to replace decades-old data exchange systems. We recruited Carole Hussey and Shell Culp, both of Public Consulting Group, discuss why these new systems are critical to the future of child welfare. It is not a secret that more information is usually better when making treatment, benefit and care decisions. Whether we are considering social determinants in public health and individual treatment decisions, or folding in information about housing and employment options for veterans, or endeavoring to understand legal and educational dimensions that affect families and children, being able to share data helps us make better decisions. The federal government has long been the recipient of summarized data that is generated by states, and so realized more than a decade ago that we could and should do a better job with data. Why, then, are we making such poor progress with effective data sharing? Sure, there are a few examples — those rare shining beacons that show how this could all work (often at the local level and not scalable) — but the widespread adoption of the vision for interoperable systems and data still seems to be missing. Moreover, the intentional movement in the direction of sharing data does not seem to be taking place. As recently as December 2016, the Department of Health and Human Services published a study showing that while two-thirds of the states have integrated eligibility and enrollment systems and use “master data management” systems, data sharing still occurs largely within the same agency. The challenges that are cited include lack of alignment of policies related to data sharing or program eligibility, limited funding, outdated or inflexible legacy systems, and federal or state rules limiting data sharing. These challenges are cited even though data sharing guidance has been published by most federal agencies. There are several fundamental issues with making sustained progress toward data sharing. One of these is “ownership.” Which agency will own and maintain the exchanges? The ownership issue is closely related to the issue of “leadership.” What if my agency is not required to participate — why would we want to divert scarce funds to something that we don’t have to do? 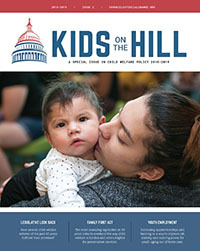 In the area of child welfare, we can make substantial progress thanks to two key initiatives: the Comprehensive Child Welfare Information System (CCWIS) Final Rule that requires bi-directional data exchanges, and the Family First Prevention Services Act, which places emphasis on prevention services and evidence-based decisions. These two initiatives provide a focal point around kids and families that has the potential to unite agencies toward data sharing. First, the recent CCWIS Final Rule provides funding for new child welfare systems that are more modular and focused on the data, rather than the system itself. Primary elements of the CCWIS are modular design with data exchange capability between the courts, education systems and Medicaid. Family First represents an enormous shift on how child welfare services are provided and financed with the aim to improve outcomes for vulnerable children in care. As the law’s title suggests, the legislation is intended to help keep children safely with their families and avoid the traumatic experience of entering foster care. It emphasizes evidence-based decisions, but HHS has yet to establish what that will entail. Trying to figure out what data is needed to continue the pursuit of evidence-based decisions, and determining how that data could be factored into a new CCWIS, takes planning and time. Most state systems currently have hard-coded single direction interfaces with outside agencies to “exchange” data, if they have them at all. For many, the notion of bi-directional data exchanges is still a science-fiction construct, and data management capabilities are not as strong as perhaps they should be. Worse, some states may end up building the “Current System version 2.0,” which would completely ignore the significant opportunity at the door. Child welfare program leaders and information technology directors have a clear opportunity to partner to make progress with sharing data that can yield data for use in evidence-based decisions. Ultimately, evidence-based decisions lead to better outcomes for kids so agencies need to make this collaborative data initiative a priority. Shell Culp is a senior advisor on human services for Public Consulting Group.